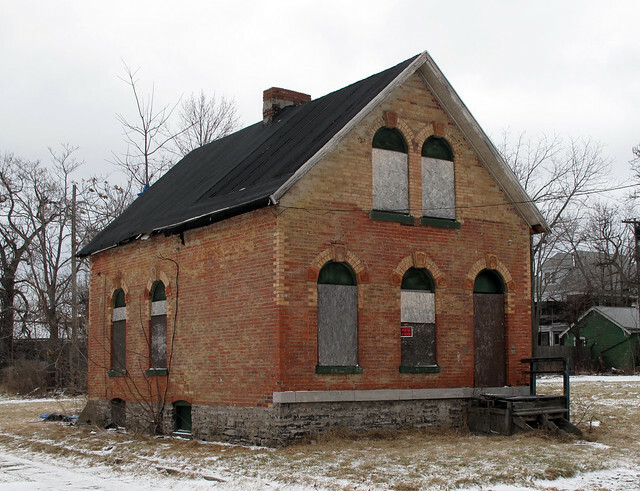 This is the first part of a new monthly series focusing on heritage properties that the City of Buffalo owns and has abandoned. Every month a new property will be featured, hard questions will be asked and regular monthly updates will present an on-going status report. 16 Harwood Place is cool. 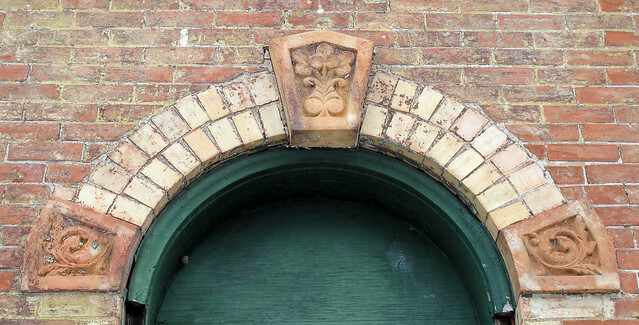 There are only two residential structures in the Hamlin Park Historic District that incorporate structural and ornamental materials that were manufactured by the J. Lyth & Sons Tile Company, with production facilities located across the street - here. The first is the Lyth family home - and the second is this lovely brick and terra-cotta cottage which stands directly behind the family's house. The City acquired Lyth Cottage in 1997. This map shows its proximity to Mayor Brown's residence and Canisius College, a few blocks away. An embarrassment of riches. Like a number of other historic cities in the northeast and mid-west that have lost substantial population, Buffalo has a very large stock of historic resources relative to its population. The number of historic structures exceeds the number the population and economy will be able to rehabilitate and reuse in the foreseeable future. This places great pressure on the preservation community and the city to determine what it is most important to preserve and how to do it. 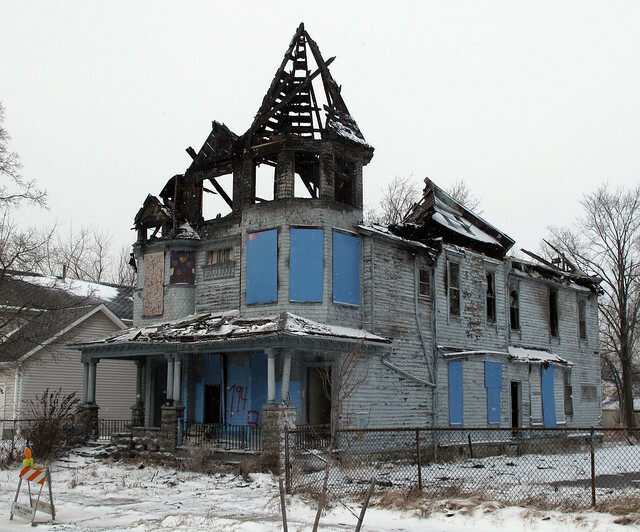 In the context of some staggering recent losses - the City-owned Wollenberg Grain Elevator (2006) and the Woodlawn Row Houses (2009) - and in light of the fact that the National Trust's annual conference will be held in Buffalo next year - the obvious question is: where's the plan? While emerging community-wide support for the landmarking of the Statler Hotel is developing (and should) what is currently being done to protect the heritage properties that have already been designated as landmarks? If the City's major preservation organizations agree with Elizabeth Waters and the findings presented in her February 2008 report, certainly Lyth Cottage deserves additional attention and protection. Preservationists should be demanding that the City showcase this property. At a minimum, the online catalog of City-owned property available for sale should include Lyth Cottage. It doesn't. Why? Architecturally and historically Lyth Cottage is the most unique residential structure the City of Buffalo owns. With the exception of its local landmark status it is physically unprotected and as of yesterday, it remains unsecured. Over the past few years Lyth Cottage has been shown to a number of qualified prospective buyers. Estimates begin at $50-75K to stabilize the shell - new roof, windows, doors, etc... - another $15-20K for new electrical and plumbing with a range of interior finishes waiting for you and your check book. Preservation standards aren't as restrictive as you might expect and allow for significant design flexibility if you can imagine a more modern addition to this place. If you're looking for a renovation project that intersects with the City's industrial and residential heritage, Lyth Cottage might be your place. New locks have been installed on the back door, if you're interested in taking a closer look, please get in touch. See the Lyth Cottage archive for more additional posts and pics. The Engel House - What Remains? An emergency demolition order was issued less than 48 hours after an early morning blaze devastated the Engel House - 194 East Utica. According to the Department of Inspections City residents spent $21.8K to demolish the structure. This included $3k for asbestos removal (20 sqft of floor tile and 75' of pipe insulation). The remains will be sent to a landfill next week. See the Queen City Farm archive for additional information and a few interior (2/2007) and exterior (4/2006) pics - here. Some fixBuffalo readers may remember this post - Saying Goodbye? - and a series of posts from 2006 which helped place 194 East Utica on the local radar. These posts caught the attention of Rod and Meagan McCallum. They bought and rehabbed a City-owned house on Glenwood, directly behind 194 East Utica. Meagan's parents moved 1000 miles and bought and rehabbed a house around the corner to be closer to their grandchildren. Her parents knew what others in the neighborhood began to understand. Rod's plan, transforming a series of vacant lots and houses in a neighborhood that most people had written off, was as real and practical as it was visionary. Deciding to live and and farm a place that is so off the radar - a place that so many people have abandoned and fled - requires the existential patience of Job. After numerous fundraisers and work days the center piece of this initiative is now gone. An arsonist set 194 East Utica on fire early this morning. In a widely circulated email this morning Rod pointed to the changed funding climate that's held up rehab plans on this part of the Queen City Farm project. 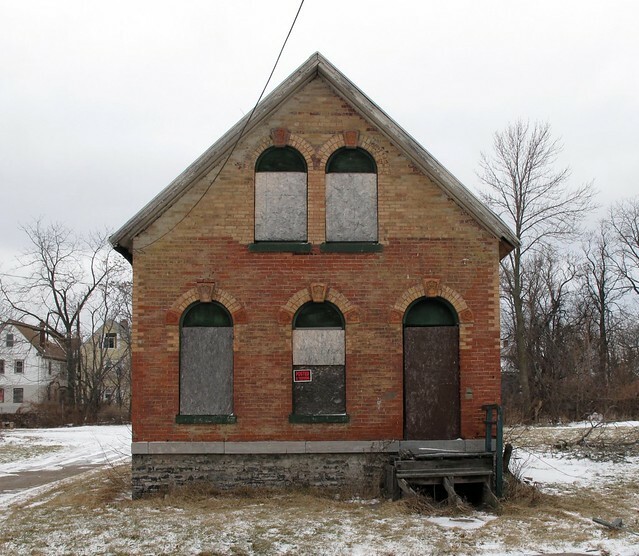 In a New York Times article - Vacant Properties: Scourge of a Beaten Down Buffalo, September 2007 - I suggested a new system of triage, a way of prioritizing the architecturally and historically significant structures, as everything can not be saved. This would be a first step and certainly help mitigate what's clearly a pattern of loss moving forward. After the identification of cool City-owned property is completed, mothballing is the second. The alternative - current plan?! - remains ad hoc at best and consists of expensive emergency demolitions. Planning and strategic thinking about these places by preservation organizations and City Hall is non-strategic, ad hoc and sadly reactionary. According to City Hall, late this morning, an emergency demolition order has not been signed. It will be ordered in the next few days as this fire ravaged hulk sits directly across the street from the temporary home of City Honors High School. 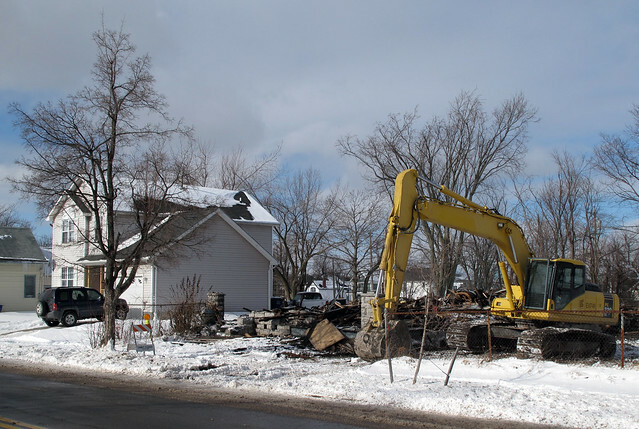 The demolition of 194 East Utica, planned by the City in 2006, would have cost $22k. Emergency demolitions always cost more. 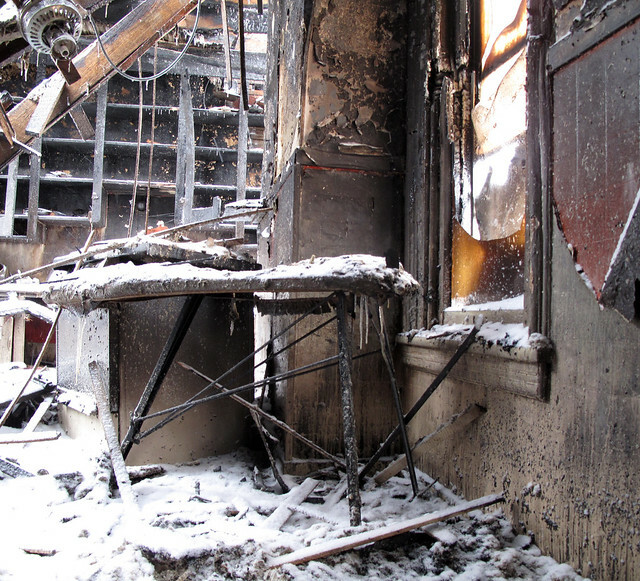 The more sensible alternative, systematic and strategic identification and mothballing, could easily take advantage of these systems - Vacant Property Security - that may prevent the arsonist from entering the structure. A plan that requires everyone pushing and pulling in the same direction would preserve these sensitive structures for future use. Some very cool City-owned places such as the Woodlawn Row Houses and the Wollenberg Grain Elevator once burned are gone forever. See - Queen City Farm video and the QCF archive for additional pics and posts. Speaking of Youngstown - Mayor Jay Williams was in Buffalo, NY for the Great Lakes Building ReUse conference in 2008. Buffalo ReUse sponsored the event and the Mayor's talk is now available for the first time, today - courtesy of Kerry Brogan at Paget Films. Here's the first of six parts. The remaining five parts of the Mayor's talk are available after this link. See Learning from Youngstown - Parts I & II. fixBuffalo readers have gotten a few doses of Youngstown over the years. Last week's Artvoice carried this short piece about our own Demone Smith and the strategic planning approach that Youngtown has embraced. If you're new to fixBuffalo or have yet to hear Youngstown Mayor Jay Williams, here's a link to a podcast from a post three years ago - Learning from Youngstown - Part I. Click and listen. Last week, Masten District Councilman submitted into the legislative record two articles about Youngstown, Ohio’s efforts to manage its shrinking population. Buffalo, Smith told his fellow councilmembers, could learn from Youngstown’s example. Youngstown, like Buffalo, has lost more than half its population since World War II, dwindling from a peak of 170,000 to just 80,000. The city’s leadership has decided to accept the likelihood of further population loss and entered into a partnership with academics at Youngstown State University to explore methods of managing the decline. The resulting plan, called Youngstown 2010, includes a radical concession to the realities faced by economically depressed cities in the Northeast with populations that are growing older and poorer: Some neighborhoods, the plan says, are (at least temporarily) beyond salvaging. So governments should stop investing in infrastructure in those neighborhoods and encourage residents to move into more viable sections of the city. The decrepit neighborhoods should be landbanked, the study says—cleared and turned into greenspace until the city’s population and tax base rebound. Demone Smith represents some of the poorest and most neglected areas of the city. If he seriously is putting this idea on the table—the idea that Buffalo ought to let some of those neighborhoods fade away rather than continue to invest in them—then maybe we ought to pick it up and examine it. 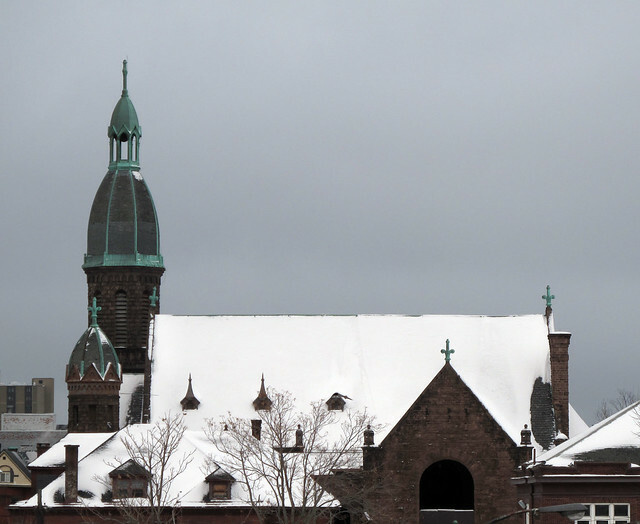 St. Gerard's on Bailey Avenue was inspired by the Basilica of St. Paul's in Rome. Construction started in 1911 and was completed in 1931. Flash forward two generations - the Catholic Diocese closed St. Gerard's in 2008. It's now destined for a new home and will be systematically dismantled, moved 900 miles and reassembled near Atlanta. With the future of Lourde's on Main Street in doubt and Transfiguration on Sycamore - long a symbol of Catholic disinvestment and neglect by an under capitalized owner - St. Matthew's on East Ferry and an ever increasingly longer list of neighborhood churches abandoned by their parishioners and congregations and other heritage buildings such as the stunning machine age Pierce Arrow Motor Car Company Power House designed by Albert Kahn on Elmwood Avenue - all experiencing demolition by neglect - is this now, moving a heritage structure South, the new preservation alternative? 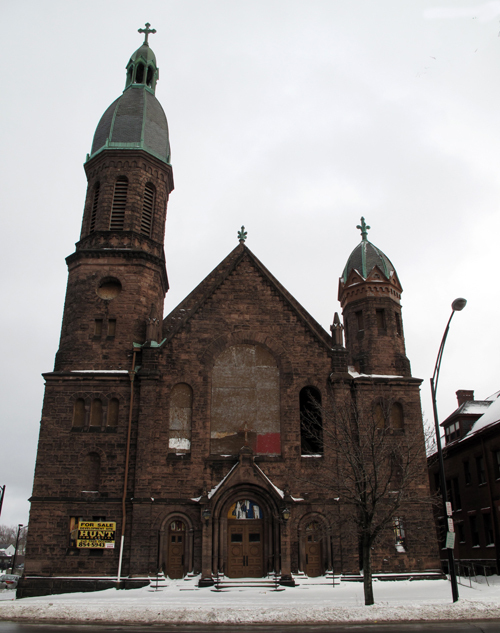 The respective economic futures of Buffalo and Atlanta on so many levels have now - since the construction of St. Gerard's began - been inverted. Are there alternatives to going South - best practices in other cities that are effectively being embraced - that should be adopted here in the Queen City for our remaining heritage sites? Are there ways - currently not being explored - to preserve, in place, our architectural assets? 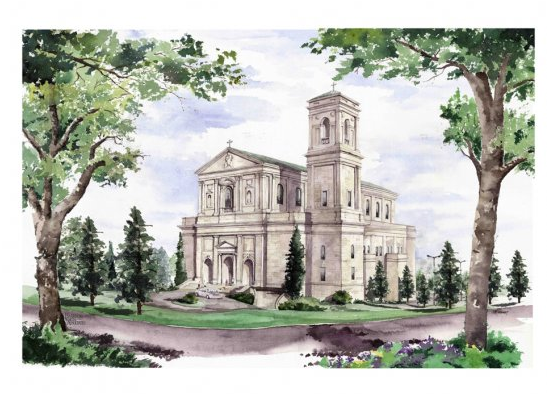 Could the architects who designed St. Gerard's, the workers who built it and the parishioners who paid for the church ever imagine such a fate? Such sacred structures were made to endure...to last for hundreds of years. So, what would it take to move the Statler? fixBuffalo readers may remember the auction here at Lourdes - September 2008 - when dozens of people gathered to glimpse and gawk at the devastated interior for the first time since the Catholic Diocese first closed the doors in 1993. Fast forward fifteen months and this amazing architectural gem is now available again. This view, from the City's Ellicott Street parking ramp shows the missing south facing window. The boards covering the front window opening - no stained glass here - were missing as of yesterday. Fred Occhino from Hunt Real Estate has recently listed 1115 Main Street at $199K. In a phone conversation yesterday afternoon Fred said the owner may consider holding a mortgage. With the staggering level of investment happening in the Medical Corridor only blocks away with the construction of the Kaleida/UB Global Vascular Institute - $500M - and the City Honors reconstruction - $40M - two blocks east, the future of Lourdes remains uncertain. Between Downtown and Ferry Street Lourdes is one of the last boarded buildings on Main Street, for now. A new year, a new face for the Hydraulics blog! The new, rebranded Hydraulics Press represents the evolution of the blog as a medium for news and stories about Buffalo's earliest industrial district, the Hydraulics. 2010 promises some pretty amazing developments in the neighborhood - some ongoing, some yet to be announced. It was time, now more than year after the blog's founding, to tweak the brand of the site and switch up its mission. 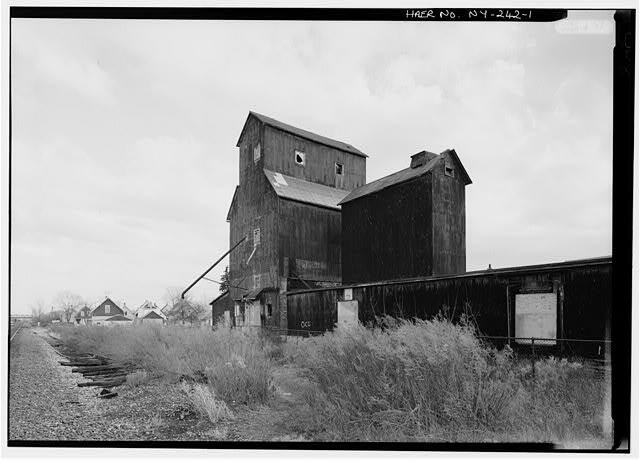 The Hydraulics Press, at www.Hydraulicspress.com, reflects the evolving orientation of the site as a news source and periodical on the neighborhood, now no longer merely confined to archival histories. It also represents a pithy play on words - it sounds like a newspaper, such as the Grand Rapids Press, and its name derives from the term "hydraulic press," the hydraulic mechanism for applying a large lifting or compressive force, the water-based equivalent of a mechanical lever. Creative, eh? I thought so! I'm excited about the continuing contribution the site will play in telling the ongoing story of the Hydraulics. Here's to a new decade, and to the new Hydraulics Press! Buffalo ReUse sent out the following announcement today. Buffalo ReUse is assembling a working group to brainstorm, research, and explore the feasibility of a new, innovative building and reuse idea. Imagine real Green Housing and Neighborhoods in Buffalo. If you have an interest in green building, architectural design, interior design--particularly with reused building materials, please join us. We also need folks with knowledge of alternative heating systems, alternative building materials, and residential building codes. 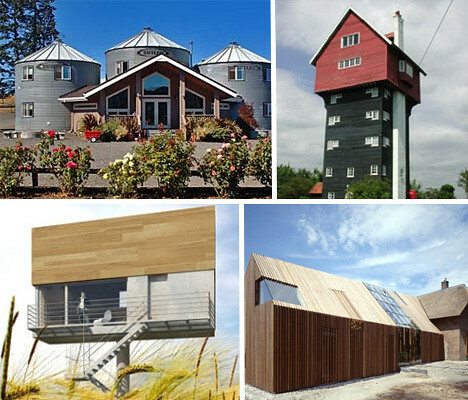 We welcome those of you who have an interest in brainstorming and working on a very out-of-the-box building reuse, rehabilitation, and eco-friendly project with a unique twist. We will hold an introductory meeting to overview the intention of the project on Monday, January 11th at 6:30 p.m. at 158 Eaton Street. The above pic is from WebUrbanist. Make sure to check out this post about 15 creative conversion projects. If you're looking for an authoritative list of Buffalo's National Register properties, look no further - wiki project National Register of Historic Places in Buffalo, New York. The site is maintained by Ted Hull who reached out recently while looking for some East Side pics. Ted grew up in Tonawanda and finished a program at UB in geography. He left the area in 1986 and completed his Masters at the University of Washington in the same field. He has worked at the National Archives since 1990 as an archivist. In a telephone conversation with Ted this afternoon he described himself as one of about 100 volunteers doing this work on a national basis - here: wiki project National Register of Historic Places. The wiki is peer reviewed. As for my interest in Buffalo, I am a native of the city of Tonawanda. In junior high, I developed an interest in history and genealogy. My mothers family settled on the old East Side in the 1840s and lived in that area for over 100 years. From that, I have had an interest in historic buildings and the changing urban landscape. In 2008, I "discovered" the Wikipedia National Register of Historic Places project and have contributed well over 1,000 "stub" articles and over 100 photos to that effort. These have included sites in Maryland, Pennsylvania, and New York. Ted updates the Buffalo wiki on a regular basis, most recently two weeks ago, with data sifted from this site maintained by New York State's Office of Parks Recreation and Historic Preservation. Ted also maintains the Niagara County wiki.